All transactions are safe and secure with a reliable history in online purchasing behind each of our associates. Buy the Saved by the Bell Turn Up the A.C. t-shirt to own Saved by the Bell clothing and merchandise. This Turn Up the A.C. shirt lets your friends know that you can't get enough of Albert Clifford Slater. The front of the tee displays an image of AC Slater (Mario Lopez) wearing a tank top. His weight-trained biceps are also visible in the design on the tee. 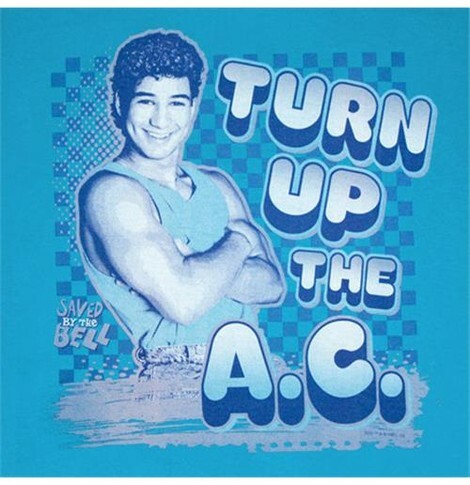 Surrounding him is the TV show logo and the phrase, "Turn up the A.C." How could anyone hate A.C. Slater? He's Bayside High School's star athlete, standing out both as a wrestler and the quarterback of the football team. In addition to the Saved by the Bell Turn Up the A.C. tee above, browse the Saved by the Bell Clothing Gallery for more apparel like men's and women's clothes, kids shirts or hoodies.